The existing Science Support Center (left) with the planned addition at right. In late June 2018, NSF authorized Leidos/ASC to proceed with construction of the ~11,000 SF expansion of the current 11,000 SF (on each floor) SSC. This "phase one" work consists primarily of the new addition to the south side of the existing structure as pictured above, while "phase two" would renovate the existing building to complete construction of the IT&C Primary Operations Facility, as the project is known as. The original plan was for work to begin in February 2019, but it actually started during the 2018-19 summer. Completion of at least of phase 1 was scheduled in 2020-21. My older coverage with links to the project details and drawings is here, while my 2019 coverage, including discussion of the funding approvals and construction photos, is on this page. Here is the "construction begins" announcement for this project from the Future USAP site. 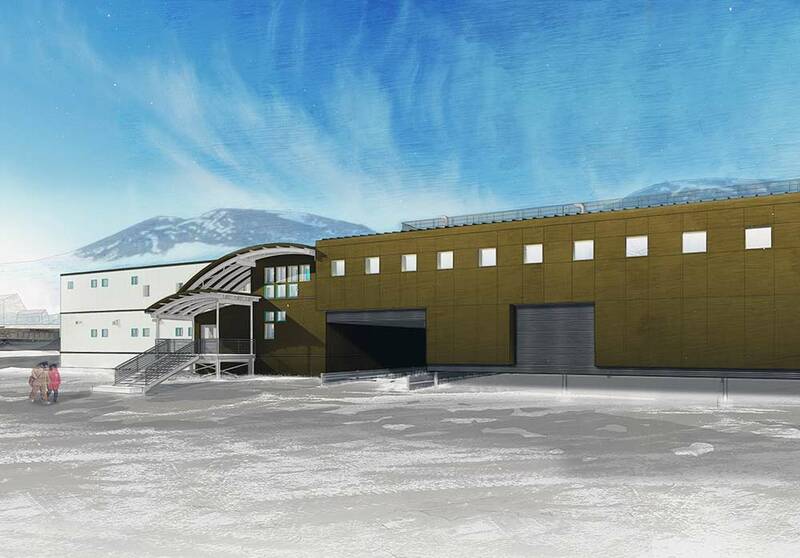 Note that while this project, as well as the April 2018 announcement that Parsons had been hired as an ASC subcontractor to work on McMurdo projects...would appear to involve the AIMS project described here, this was not so. The AIMS project is a specific budget line item, and was only initially and officially funded by Congress in February 2019. This is similar to the SPSM project that Congress authorized to create the current South Pole Station. Credit...the photo on this page, from the USAP "Construction Begins" page, is from Ferraro Choi.